Have you ever stared at the sky when it was scattered with clouds, searching for an answer to an important question? Or perhaps you’ve sought counsel in Tarot cards, the Chinese I Ching or the Celtic Runes. These are forms of oracular guidance and problem-solving known as divination. The many forms of divination seek to find answers from sources that are hidden from daily life. They show us the “divine will” in answer to important life questions. Changes, challenges and questions fill our lives. How we respond to them can affect us for years to come. Shall I buy this house? Is this a good location for my business? How can I increase my creativity? How do I slow down to my own natural rhythm? The ancient world had many sacred sites and temples available for divination purposes. People journeyed there on pilgrimages, seeking advice for their problems. The Delphic Oracle in Greece is perhaps the best known. Priestesses who possessed great spiritual power served as oracles there. They served the great mother goddess, Gaia, performing oracular divinations deep inside the earth beneath the Temple of Delphi. The Delphic priestesses could see into the future and were in direct communication with Gaia who possessed the wisdom of the universe. When asked a question, the priestess would go into trance while holding a snake in each hand. She would speak an answer in a sacred language. Receiving direct revelations from Gaia, the priestesses were renowned for the accuracy of their predictions. The Delphic Oracle was part of a time-honored shamanic tradition. As a spiritual problem-solving methodology, shamanism has been in use for the last forty thousand years. Shamans employ the divination tools of the drum, bones, crystals and spirits of nature. They are able to read answers in the rustling of leaves, crackling of fire and whistling of rivers. Nature is alive and spirit-filled. The shaman interacts with nature powers and thus is able to divine weather, diagnose illness, locate lost people and solve problems for individuals and the tribe. One of the classic techniques used by shamans in the far north is the placing of a dried caribou scapula (shoulder blade) into a sacred fire and asking the spirits for an answer to an urgent question, such as where are the migrating herds of caribou. The cracked and blackened scapula is then pulled out of the fire and read by the shaman, just like a map. Time and again this method works. The herds are found in exactly the location shown on the scapula. The tribe survives another winter. Similarly, the shamans in old China used tortoise shells blackened in the fire. These are the origins of the modern I Ching Book of Changes. Thankfully, coins have taken the place of tortoise shells. According to the ancient Chinese, writing was also originally created as a divination tool to connect with divine source. Many shamanic divination techniques are used for looking into the future. When a child is born, a shaman can see what the soul of the child is bringing in and what her soul wants to express. Once this is revealed, these talents and gifts can then be nurtured by friends and family. Crystal gazing techniques are also well known among shamanic peoples. Natural quartz crystals are strong energy magnifiers, and a shaman can look into the crystal for an answer to a person’s question, seeing present circumstances as well as future ones. The drum is used in many shamanic cultures as a divination tool. Among the best known peoples who used the drum are the Sámi people of northern Scandinavia. So popular was the drum in certain areas in the 1700s, that every household had one. (Drum-Time 20). They were used in everyday life to discover information crucial to survival. 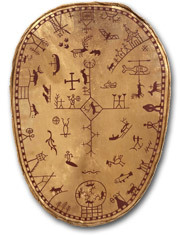 Small pictures and images were painted on the drum face and a ring of brass or a pointer of reindeer antler, was laid on the top. As the drum was beaten, the pointer moved over the figures. (Drum-Time 20). These pictures included whale, reindeer, boats, skis, elk, mountains, goddesses and so on — depicting important features of the world the Sámi lived in. The path that the brass ring took over the figures and where it stopped, could be read like an oracle. A household might ask, “What weather is coming?” “Will the hunt be successful today?” “Where are the reindeer herds?” and “Will we have enough food this winter?” (Drum-Time 20). In these earlier times the messages of the drum were known to save people’s lives. Without their council, people would have starved to death or been overtaken by warring tribes. In those days there were no weather channels or cell phones, no GPS or helicopters. The oracular power of the drum was alive with the voices of the compassionate spirits. Helping spirits in the form of power animal allies, spirit teachers and ancestors all help the shaman and the modern day shamanic practitioner to uncover guidance from hidden sources, information not readily available otherwise. Questions like, “Where should we move to?” “How do we prepare for the coming winter?” and “What crops do we best plant this spring?” are important divination ones. The shaman is like a human tuning fork, singing the truths of prophecy and divine wisdom through her bones. Last year I was in a huge transition and wanted to have all my power and energy in one place. I needed to sell my home in Santa Cruz, and my tenant was creating havoc with the process. Distressed, I went out to walk in the hills in Mount Shasta, seeking the wisdom of the helping spirits. I was wrestling with the question of whether to pay a moving company to move my tenant out. Clearly I didn’t invite this extra expense, but she experienced it as a hardship to live in a house that was going on the real estate market. Suddenly a magnificent bald eagle flew right across my line of vision, cutting through all my uncertainty. The answer was immediately clear. Be kind, do the right thing, share your resources. The movers were able to move her out within two days and the house was easily readied for sale. Serendipitously, a month later I learned that there were allegedly illegal things being grown in my backyard. This confirmed that I’d made the right decision. The helping spirits were in possession of even larger information than I knew at the time. Shamanic divination methods help us see big truths about our past, present and future. When we ask the compassionate spirits for what we truly need, vast healing and wisdom open to us. We can change our story from being victims of circumstance and move into our empowered, whole selves. We can remember who we are, what our soul’s purpose is and what gifts we came into this lifetime with. Westman, Anna and Utsi, John E.; Goábdesajgge (Drum-Time: The Drums and Religion of the Sámi) 1999. Print. Beth Beurkens M.A. is a poet, creative writing teacher and shamanic practitioner of 22 years. 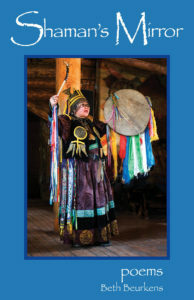 She is on the faculty of Rogue Community College, College of the Siskiyous and the Foundation For Shamanic Studies. She has studied extensively with Michael Harner and Sandra Ingerman.